What happens when a little boy doesn’t want his hair cut? We sat down with two moms who let their boys grow long hair despite criticism and awkwardness from other adults and kids. In 1968, the rock musical Hair opened on Broadway. At the time, its emphasis on men who grew long hair as a form of radical expression was considered ground-breaking. Is long hair on boys still an issue? According to two moms who have allowed their sons the freedom of self-expression, there are ups and downs to being a boy with long hair. Carrie Anne Badov is editor-in-chief at Everything Mom. 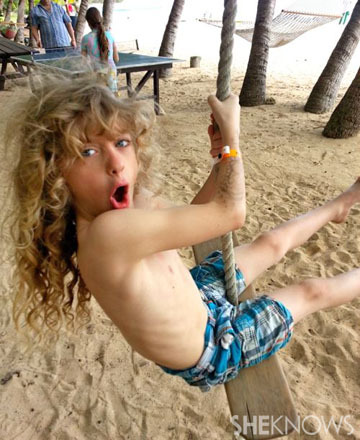 Her 9-year-old son (pictured above) has never had a haircut. “At first my husband and I decided to keep it long because he had these lovely blond curls, unlike anyone else in the family, but as he grew older we turned the haircut decision over to him,” she says. Peers and adults often tell Mannix that he looks like a girl. Susan Goldberg writes at Mama Non Grata and has two sons. Her 9-year-old, Rowan, hasn’t had a haircut in three years. He never explained exactly why, but he was clear that he didn’t want it cut. His mom agreed that as long as he kept it clean, he could grow it out. Now that his hair falls to his shoulder blades, Rowan is often mistaken for a girl, a situation that sometimes results in awkwardness. If your son wants to grow his hair long, be prepared to respond to simple misunderstandings as well as teasing. Practice short dialogues with your son so he’s ready to answer adults or peers who mistake him for a girl. Talk about expression and identity and ways to diffuse teasing. Try to emphasize that there’s nothing inherently insulting about being called a girl. When it comes to openly critical responses from adults, try to stay calm but firm in your family’s decision. You’re simply honoring your son’s wishes.